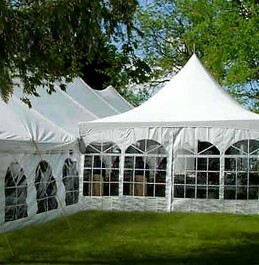 We carry many sizes of tents/canopies. It all depends on your intentions and the nature of your event. 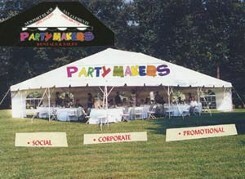 For a stand-up cocktail party you will need 8sqft per person. For a buffet dinner you will need 8-10sqft per person. 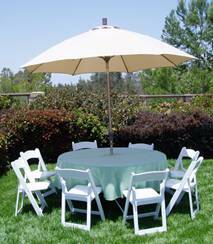 For a sit-down dinner party you will want about 10-12sqft per person. Our tents have a California state fire approval patch. We also provide a fire extinguisher. for every 800sqft of tenting and a no smoking sign. While we will be happy to assist you in an advisory capacity, customers are responsible for fire inspection and permits necessary for their events. We will come out to the site and inspect for proper location, call for estimate.